Cyclone Yasi flattened properties, overturned luxury yachts, and ripped up plantations. 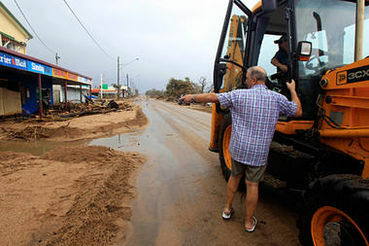 Australia's climate change adviser warns of more such storms to come. The powers that be had better get working on plans for a better outcome next time. Fair insurance pay outs, properly equipped refuge shelters etc. Not only plans for a better outcome next time - also immediate actions to 'stop and reverse' the imbalances created on our planet. Humans had the biggest 'finger in the pie' to stuff up the planet's systems, so those same humans should start addressing over population and everything else! No matter how small the action, DO something in an effort to reduce your footprint, it's not only for the benefit of future generations. God gave you life - see that you depart from Planet Earth leaving it in a better state than when you 'arrived'. Together we CAN!!! There were no deaths and that was amazing. What is more amazing is the media blanked out on there being any connection between the widespread floods, the cyclone and global warming. Thanks Cal. A bit late in reading this, but 2+ billion money for loss of luxury yachts, plantations & developers of destruction that have replaced the native inhabitants of All sorts!!?? MY sorrow is Not for the pre-mentioned human owners(?) but for Australia, the land, the ocean surrounding, the 'other' than human. All would have held up much better in this Nature's storms, if the human inhabitants (read euro/american forebearers) of the past 3 or more centuries had tried to live in Balance with the continent, islands, and the living beings there before their invasion. I am very concerned about my friends, as if they are in a different dimension than the plantation, developers, and yacht owners. Perception vs. knowledge/truth can be quandry.